PETER SEAMUS LORCAN O'TOOLE, or, as we like to call him, the greatest motion picture actor ever, was offered a knighthood in 1987, but he turned it down. It is open to speculation as to why, but we suspect it's because he's no dummy and is holding out for them to offer him a hood that he can wear during the day too. Peter O'Toole also has all of Shakespeare's sonnets memorized. Peter O'Toole is such a romantic! And generous to newcomers to the business too, considering that this Shakespeare kid hasn't even directed a single motion picture yet. A lifelong player, coach, and enthusiast of cricket -- and we'd pay to see him hopping around and rubbing his wings together to make chirping sounds -- Peter O'Toole is the most-nominated actor NEVER to win an Oscar, for which the whole Academy oughta die in a fire. The year Peter O'Toole was nominated for The Lion In Winter, Cliff Robertson won for Charly. The silver lining is that, now, Cliff Robertson is dead. It will bring audiences back to that peak of excitement what they haven't experienced since that pinnacle of motion picture history that we all know as Lawrence of Arabia. Ah, Lawrence of Arabia! Just the title makes us tingle with arousal! It is widely considered one of the greatest and most influential motion pictures in the history of cinema -- by MORONS, 'cause everyone who's not a moron knows that it is THE greatest and most influential motion picture in the history of cinema. Produced by Sam Spiegel and directed by David Lean, who is second only in creative prowess to the great Orson Spielcock himself, Lawrence of Arabia tells the heartwarming tale of the remarkable, enigmatic Lawrence (Peter O'Toole) who meets Obi Wan Kenobi (Alec Guiness) and assists him in revolting against Turks. Together they engage in gorilla warfare, the smell of which can indeed be revolting. In the end, Lawrence (Peter O'Toole) becomes famous -- almost as much as Schwartzy and Pagana -- and gets raped by Turks -- almost as much as Schwartzy and Pagana. Although in our case it was more by actual turkeys, not just fellas what calls themselves Turks. We've learned a lot from Peter O'Toole. For instance, we've learned, to our surprise, that a fella can actually be Irish and Scottish and what have you, but still be okay in our book. (For that matter, we ARE writing the definitative book on Peter O'Toole as a companion piece to our forthcoming definitative opus on corned beef hash.) Schwartzy has learned that boys what have attended Catholic school can be as exciting as dames that have attended Catholic school. And Pagana has learned that left-handed doesn't only mean that someone accidentally left their hand in their pants. 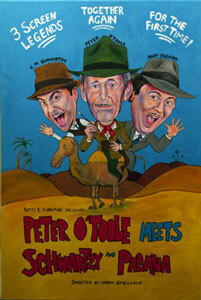 Peter O'Toole's middle name, Lorcan, was apparently named after Peter O'Toole's own son Lorcan O'Toole, a painting of which we had commissioned and can be seen to the left. Lorcan O'Toole is an actor in his own right, having appeared in a bunch of things we've never heard of (which is a shame because people should drop at his royalty feet) as well as appearing with his father in the upcoming Peter O'Toole Meets Schwartzy and Pagana, even if he doesn't know it yet. AND WE'RE VERY EXCITED TO WORK WITH HIM. 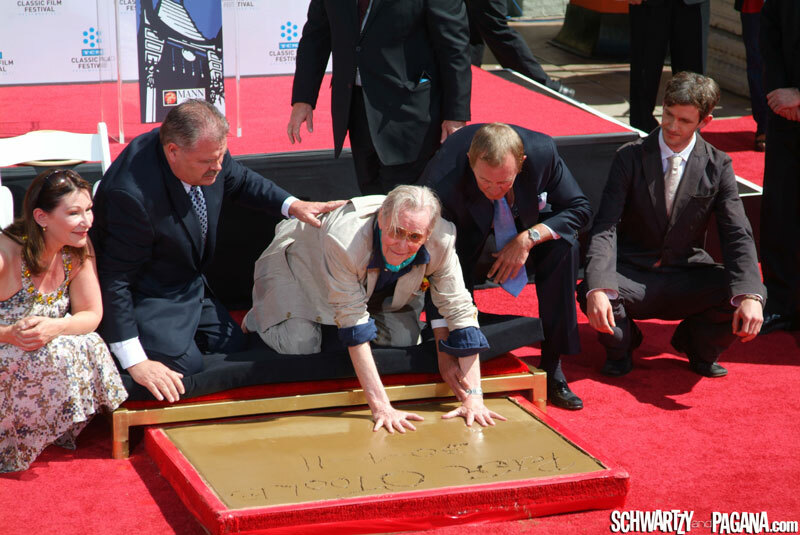 In 2011 A.D. the year of our lord, Peter O'Toole finally got to have his hands and feet enshrined on the Hollywood Walk of Fame right here in Tinseltown, the city of dreams, Hollywood. 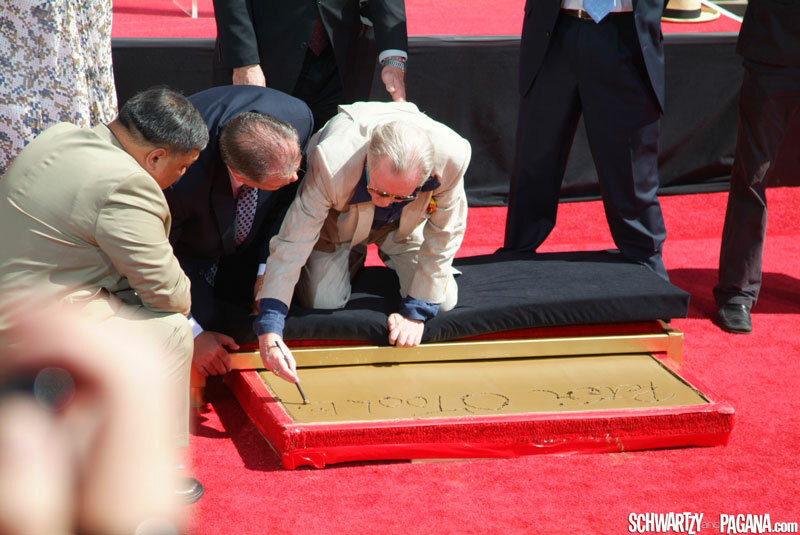 Other celebrities who were there as part of the festivities include Barbara Hershey, Schwartzy and Pagana, and Angelica Huston. 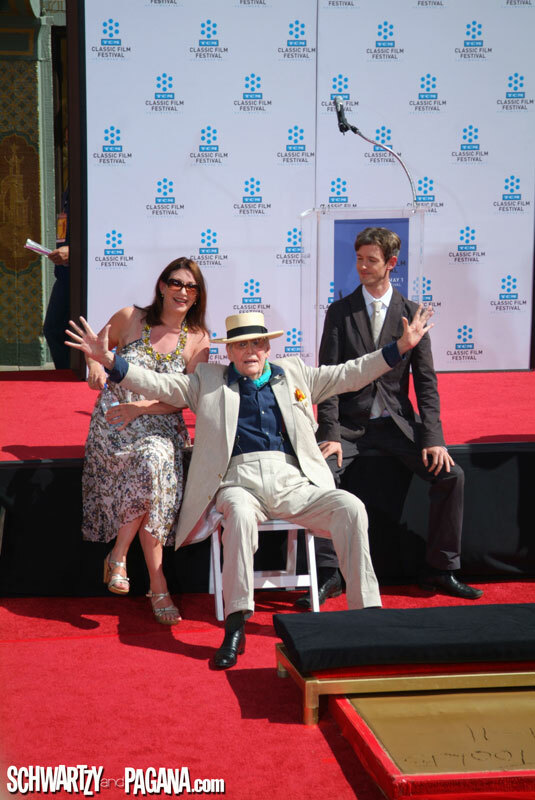 BY THE WAY: Peter O'Toole is still alive, so stop asking us that. We get so mad when people ask us that. 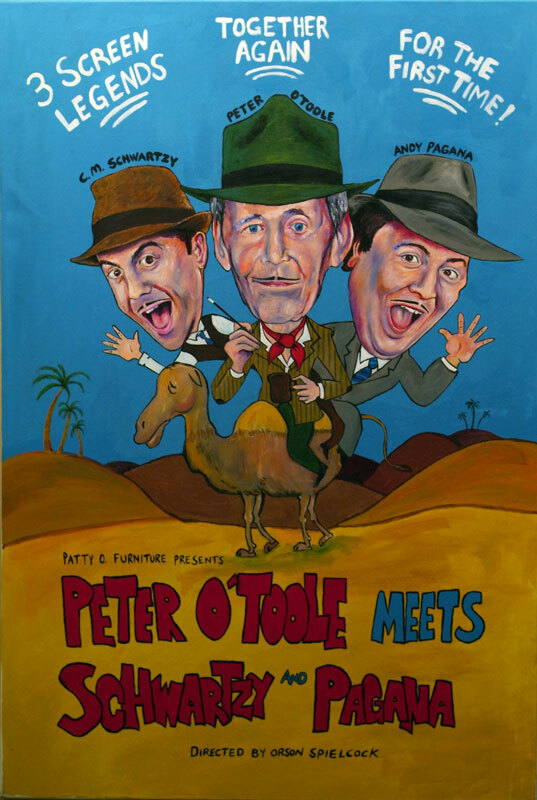 Peter O'Toole in fact is still very active in the show biz, with several motion pictures currently in production, including Cristiada, Katherine of Alexandria, Mary Mother of Christ, and Peter O'Toole Meets Schwartzy and Pagana.